The New Horizons mission team reported several unusual findings concerning Pluto this week at the 47th Annual Meeting of the Division for Planetary Sciences (DPS) of the American Astronomical Society (AAS). 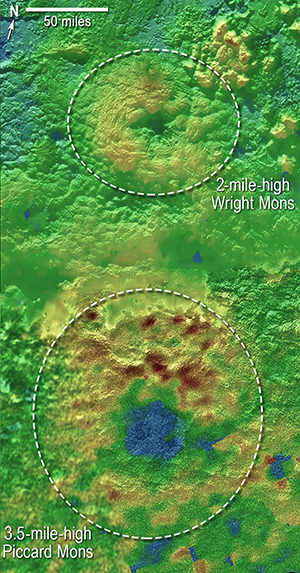 Among the biggest was the discovery of two large and distinct mountains that New Horizons geologists think could be recently active “cryovolcanoes”. So-called cryovolcanoes are thought to spew a semi-frozen slurry of water ice, nitrogen or other gases instead of fire, smoke and lava like traditional volcanoes. The two geological features were discovered by combining images of Pluto’s surface to make 3-D topographical maps (see left). Crater counts supposedly revealed other geological oddities on Pluto, namely a wide range of surface ages that indicate Pluto has been geologically active for much of its 4 billion year existence. It is unknown if the mission team has any speculation as to how a minor planet smaller than our moon, located over 1.6 billion km (1 billion miles) from its nearest neighbor and over 40 times the distance from the Sun as the Earth could experience any type of geological activity for such a long period of time. Other interesting information revealed by the New Horizons mission team concerns the highly eccentric properties of Pluto’s moons. Most of the moons in our solar system are in synchronous rotation around their respective planets with one side always facing the planet. Four of Pluto’s five moons rotate at much faster speeds, with the largest Charon being the exception. And all the moons wobble much more than scientists expected and are described as “behaving like spinning tops”. Of course their first suspect is Charon and its gravitational influence upon the other moons. They also proposed that the double-lobed shape of several of Pluto’s smaller moons could be the result of the merger of even smaller moons caused by a large impact in the past that formed Charon. These double-lobed shapes are very similar to the shapes of 67P/Churyumov–Gerasimenko and other observed cometary bodies in our solar system. Can all of these objects really be the result of slow-moving collisions between two separate objects as has been proposed for Comet 67P despite the difficulty of replicating such collisions and mergers in computer simulations? Perhaps some sort of electrically-driven erosion is a better explanation?